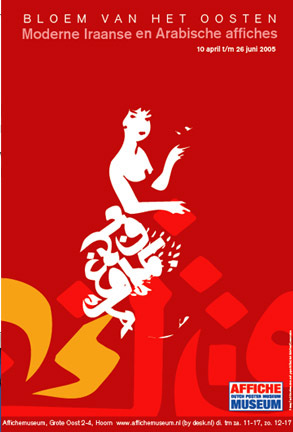 The exhibition of Arabic and Iranian posters opened at the Dutch Poster Museum in April. I have helped the museum guest curating the expo, and collecting the Arabic posters, but unfortunately I was not able to attend the opening since I was out of Holland at the time. The opening was attended by Anthon Beek and Ben Bos. Reza Abedini from Iran was the guest curator for the Iranian Posters show. This is the first time and exhibition of the kind- particularly featuring Arabic posters- took place in Holland. We had a hard time collecting the posters, but we managed to have 50 Arabic posters on display- mostly from contemporary designers around the Arab world, particularly from Lebanon- but some very interesting Egyptian posters from the cinema industry. The hard work preparing the expo was rewarded by the chance to design the poster for the exhibition, in large format, which was distributed across Holland. Welcome to the blog of Tarek Atrissi Design; It is the professional and personal visual diary archiving observations on visual culture, design, typography and type design in the Arab world today; Observation based on personal, commercial and educational projects and research activities we are involved in.